Avigdor Liberman lambastes Netanyahu for blaming Amona demolition on his IDF military secretary. Former Defense Minister Avigdor Liberman lambasted Prime Minister Netanyahu for blaming Thursday's violent Amona demolition on his military secretary IDF Brigadier-General Avi Blut. "The prime minister's shameful attempt to put the blame on the evacuation of Amona to his military secretary, Brigadier-General Avi Blut, is at the least despicable, and it is impossible to avoid seeing this as an evasion of responsibility and a desperate attempt to search for a scapegoat," wrote Liberman on Facebook. Blut will be summoned on Friday to meet with Chief of Staff Gadi Eizenkot after he did not pass on Netanyahu's instructions not to vacate the buildings in Amona. The military secretary passed the prime minister's instructions only in the morning when the violent evacuation had already begun. In clashes between opponents of the evacuation and the security forces, 23 policemen and three residents were injured. Blut had recently replaced Brigader-General Eliezer Toledano as Netanyahu's military secretary and is tasked with maintaining the correspondence between Israel's highest elected official and the military. A member of the national religious community, Blut grew up in Neve Tzuf (Halamish) in Samaria, and attended the Eli pre-army academy. 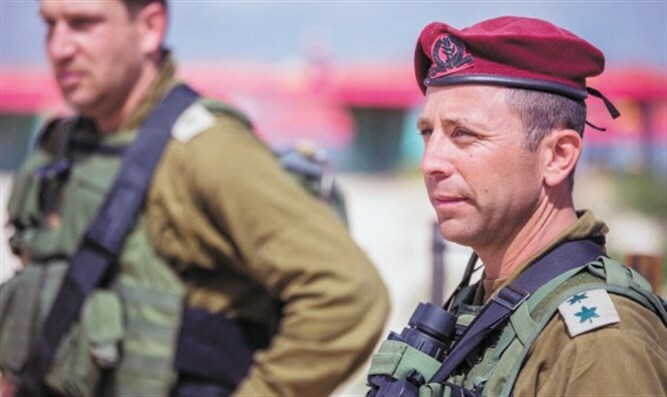 He has previously commanded the Judea Regional Brigade and the 101 Battalion in the Paratroopers and was wounded in Operation Cast Lead back in 2008.